Mariner Software’s MacJournal has long been an “iPhoto for journaling.” It's a powerful text editor that features support for multiple journals, blogging, rich media, and MobileMe sync, along with a healthy dose of iLife integration. But one realm into which it hadn't ventured is that of the iPhone—until now. Mariner MacJournal is a new journaling and blogging client for the iPhone. Users can chronicle their thoughts and lives across multiple journals, then blog it to a variety of services including WordPress, Blogger, and even MobileMe. They can also set a passcode to lock Mariner MacJournal, search journal entries, and compose in both landscape and portrait views. One of Mariner MacJournal’s most appealing features is that it syncs with its big brother on the Mac. As long as your iPhone or iPod Touch and your Mac are on the same Wi-Fi network, the two MacJournals can exchange entries and journals, though syncing of media like pictures and audio entries is not yet supported; Mariner says to look for that in a future update. 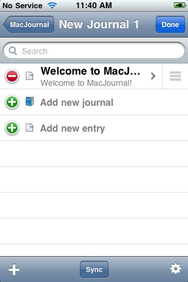 Mariner MacJournal is $5 and requires iPhone OS 3.0 or later.